The Trust - Do You Really Need Renters Insurance? Many years ago, when I was an apartment-dwelling single guy, I enjoyed living in a very comfortable bachelor pad — a one-bedroom apartment with a double garage beneath it. One Monday, I came home from work at the same time as my neighbor who was returning home after an extended weekend out of town. Renting a house or apartment provides one with several measures of freedom and flexibility. Among these is freedom from responsibility (and homeowner’s insurance premiums) if your dwelling is damaged by someone or something other than you. But what about your furniture, your electronics, your other treasured belongings? Who pays if your worldly goods are damaged or stolen? Also, what if one of your dinner guests trips and falls, or your dog bites a visitor who now needs medical attention? Your landlord generally isn’t liable for those expenses, and your lease typically only covers damage to the dwelling (not caused by you) and does not provide protection for its contents or your personal liability. I don’t recall if my neighbor at that time had renters insurance (I certainly hope so), but I distinctly remember his anguished expression as he watched his drenched valuables float out into the parking lot. According to the Insurance Information Institute, only 41% of renters have renters insurance, compared with 95% of homeowners who do have homeowners insurance. To be fair, most mortgage lenders require homeowners to carry homeowners insurance. It is not as likely your landlord will insist on your buying renters insurance as a condition of your lease, however. That doesn’t mean you don’t need renters coverage. If you own anything of value, you very likely do. Renters may skip buying insurance because they assume it is too expensive. However, for the cost of a gourmet pizza or a modest caffeine habit at your local coffee shop, you could easily protect $40,000 worth of your belongings and provide $100,000 of personal liability protection for an average cost of about $17 per month. Cover your living expenses if your rental unit is severely damaged and unlivable. 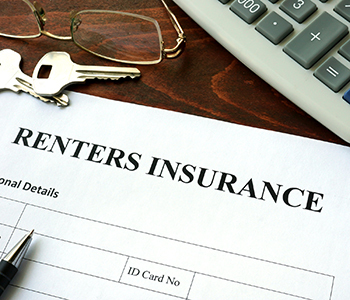 The actual cost of your renters insurance will depend upon several factors. If you select a higher deductible – the out-of-pocket expenses you must pay for each claim – your insurance premium will be less. Likewise, choosing actual cash value coverage for your possessions is less expensive than electing replacement value coverage, although the cheaper policy will only pay you the “used” value for your stuff. If you’d rather not buy used, you might need to opt for the pricier replacement value coverage. Your insurance company may offer some discounts if you purchase multiple types of coverage through them. Ask your auto insurance company if they also provide renters insurance at a discount if you buy it from them as a current customer. If your rental unit has smoke detectors or a security system, these might be worth additional discounts on your insurance premium. Buying a renters insurance policy can definitely seem like just another bill to pay. It can also feel like a real lifesaver if you come home to a fire, flood, or storm damage (or a neighbor’s wonky water heater) and discover your destroyed or missing possessions are no longer all that valuable. I never had to use my renters insurance back then, but after enduring numerous hurricanes (and one tornado), my homeowners insurance has paid for itself several times over. If it’s worth owning, it’s worth insuring.